At the beginning of the 20th Century, people living in the mountainous regions of the prefectures on the Japan Sea coast were already using primitive ‘skis’ to get around. They were instinctively using long pine skis to move around on and bamboo poles for balance. 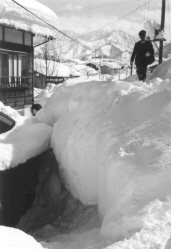 Enjoyment and sport was far from these people's minds as they tried to survive in areas where accumulated snow of five, six or more meters was not uncommon. 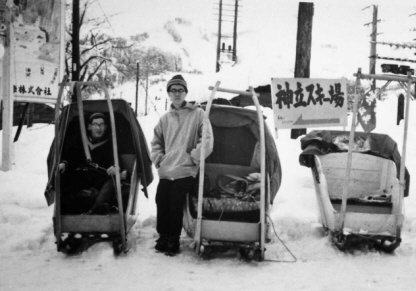 The thought that this form of transportation could actually be a leisure activity and even become big business arrived here when an Austrian gentleman named Hannes Schneider introduced more developed skis that were lighter and had primitive bindings to Japan in the 1930's. Mr. Schneider, complete with his expensive three-piece suit - worn at all times, even coming down the slopes! - impressed those around him. 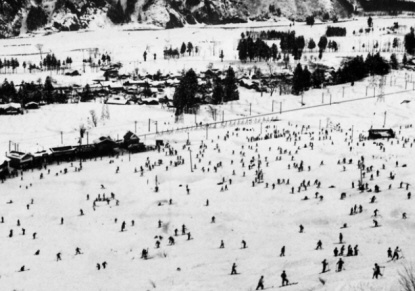 This marked the beginning of the first ‘skiing boom’ in Japan. Japan has no shortage of mountains. 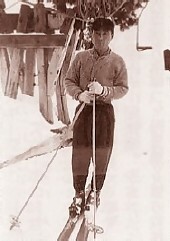 Mountains account for over 80% of the land area of the country and provided what must have seemed like endless opportunities to enjoy this new sport. 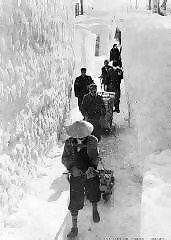 Business soon took hold of the ideas and began to develop some of the slopes in the snowy mountain regions of Honshu and Hokkaido. Ski-jo suddenly appeared all over Japan, and some of today's best resorts had their beginnings around that time. 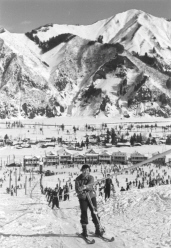 The World War halted the rise in popularity of the sport, but skiing started to develop again in the 1950’s when foreigners from Tokyo would head out to visit the resorts concentrated on the island of Honshu. It was in 1956 that one of the great heroes of Japanese skiing to this day, Chiharu ‘Chick’ Igaya, won the first Winter Olympics medal by finishing second in the slalom at the 1956 games in Cortina, Italy. Although the sport developed slowly, in 1972 the Winter Olympics were held in Sapporo at the Teine Olympia and Teine Highland resorts. Twenty-six years later, the Olympics returned to Japan for the 1998 Nagano Winter Olympics. Japan is now on the winter sports map and every year hosts international events such as World Cup ski jumping, alpine, Nordic, freestyle and snowboarding events.